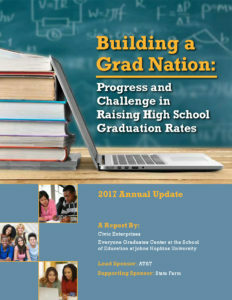 2017 BGN Exec Summary vFINAL The 2017 Building a Grad Nation: Progress and Challenge in Ending the High School Graduation Rates report is co-authored by Jennifer DePaoli, John Bridgeland, Matthew Atwell, and Erin S. Ingram of Civic Enterprises and Robert Balfanz and his team at the Everyone Graduates Center at the Johns Hopkins University School of Education. The 2017 report is presented by lead sponsor AT&T, with supporting sponsorship from State Farm. Follow this link to read the full 2017 Building a Grad Nation report, or follow this link for the 2017 Executive Summary.